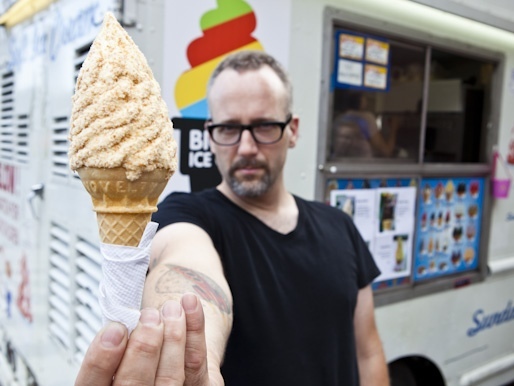 I’m way super psyched that this morning my first ice cream interview comes out on Serious Eats NY. On a gorgeous day in Union Square I had a fun and absurd talk with Doug Quint of Big Gay Ice Cream. My editor told me it put a smile on his face from start to finish. I like my editor. Hi Max. As I prepare food for my the family I work for to eat on my days off, seeing another interview go live pumps me up for returning to Manhattan and sitting with a few more awesome people – first Anita Lo, who I am incredibly excited to sit with. And then George Mendes, a fellow Portuguese chef who I can’t wait to brain-pick. As I type at my iPad in my work kitchen, pondering what food I’m making today, I’m feeling very much at peace. I am exhausted from a long weekend of cooking for many people. But they were all lovely people, and I feel like I’m starting to get good at my job, finally settling into my skin with it. I’m going home to a good man who I really care about who is making ME an insane dinner tonight. And I’m celebrating turning 31 this week with my wonderful family, my dearest friends, and sustainable health. I am much happier right now than at this time last year, when turning 30 felt significant but hard. For the first time in my life I feel – naturally and fully – an adult. It was a weird realization… But a comfortable one. Go check out my interview with Doug on Serious Eats NY, to start your day off on a happy note. Love your post and your website! So excited for you and all of your accomplishments! Happy Birthday – hope it’s a great year for you!